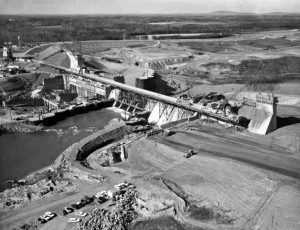 Lake Norman was completed almost 70 years after the initial idea was introduced by an engineer from South Carolina, who was working on a project to form the world’s first hydroelectric power plant at Niagara Falls. The Lake Norman project was put into motion in 1905 with only $50,000 startup funds, provided by James “Buck” Buchanan Duke of North Carolina’s tobacco company. Initially, Catawba Power Company was formed. After multiple name changes, it became Duke Energy, as you know it to be today. Buck Duke was the original founder of Duke Energy, and was responsible for the formation of Lake Norman. The company still manages the 520+ miles of shoreline today. The lake began to fill in 1963, after all of the land that was originally in its place including houses, churches, farms, and industrial buildings, was finally bought out by Duke. Sounds like a typical corporate buyout, right? Purchase the land, tear down the properties on it, level it out and start anew…only that’s not exactly how the forming of Lake Norman happened. Instead, the majority of the land was left alone, buildings stood in their place, and locals were asked to relocate their homes. Only a few of the taller buildings were demolished because of the risk they may have posed to boats traveling on the lake, and a few standalone graves as well as entire cemeteries were relocated. Besides those few items moved or destroyed, everything else in the town remained as water began to flood the city. Take a dive down about 100 feet and you’ll find a lost city that served as a noble sacrifice over 50 years ago, for the miles of Lake Norman waters we now call ‘home’. Those that graciously agreed to relocate their lives and businesses in order for the lake to be formed, recall now the excitement they had watching the waters rise and a new beginning being created. The underwater city below Lake Norman is an interesting part of its history that absolutely deserves acknowledgement and remembrance. In celebration of the lake’s 50th anniversary in 2013, archivists from the local Davidson College started a project to document the pieces of land and structures that were covered during the filling of the lake, beginning in 1963. So now, when you think of Lake Norman, you may and should still think of those adventurous Summers and beautiful sunsets on the water, but also of the history behind it and where it came from. Interested in learning more about the lost city under Lake Norman? Read through Davidson College’s findings here.